It was perhaps fitting that our first dinner in Portland was at Fore Street. Opened in 1996, the restaurant appears to have been on the front edge of Portland's emergence as a serious food town. As I noted earlier, the whole farm-to-table ethos seems to come very naturally to Maine's restaurants, and this is on clear display - even literally - at Fore Street. A block off the waterfront in an old warehouse, the restaurant's physical layout is a fine preview for the straightforward honesty of its food. As you enter, there's a glassed-in pantry that holds a bountiful display of fresh produce, mostly sourced from local farms. But even more striking is that if you're not careful, you will walk right into the garde manger station, which is set up in an open kitchen right as you walk into the main restaurant space. In its own way, it was one of the most dramatic and effective restaurant entrances I've ever experienced, in part because it feels uncannily as if you're walking into someone's home and kitchen. The seating areas are arranged in two tiers, one at the height of the kitchen and filling the center of the room, with more seating around the walls opposite the kitchen, raised stadium-style a few steps higher. We had a cozy spot right in the corner which gave a fine vantage for that open kitchen. My recollection is that the menu was divided up by preparation methods as much as by typical "appetizer" "entrée" "side dish" groupings, though candidly my memory is a bit fuzzy. Throughout, the menu showed a strong focus on seasonal and local ingredients, both from the ocean and the ground, as well as a section devoted to charcuterie and offal, which of course I found alluring. 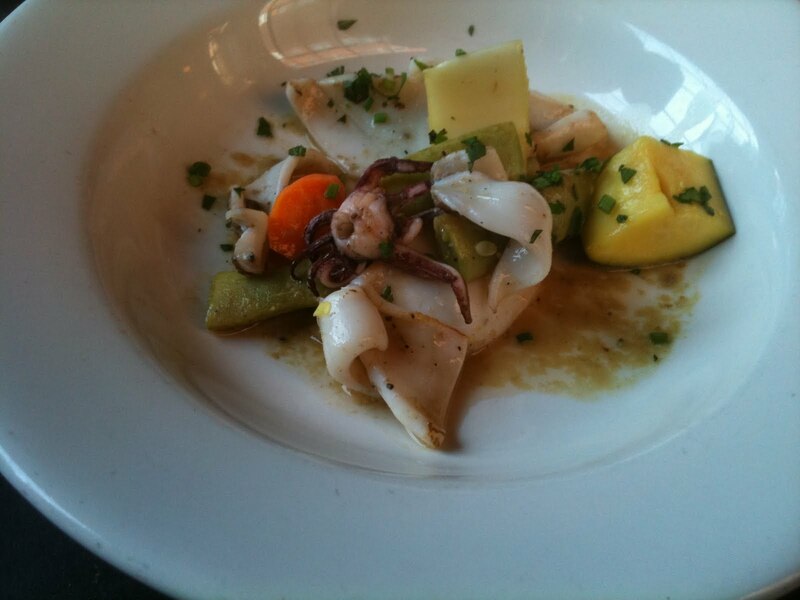 I started with a dish of grilled squid, cut into wide curling ribbons, paired with a variety of pickled zucchini, peppers, and carrots, and spinkled with snipped chives. It was a simple dish with the tart pickled vegetables pairing well with the super-fresh squid. We also had a tomato soup with corn, its bright vermilion hue matched by a real intensity of fresh tomato flavor. The only miss among starter-type items we had was a salad with cold, slippery mushrooms that didn't highlight their flavor or texture. The bread, I should note, was fantastic, all crusty and chewy: the restaurant is part of a family that also includes a couple bakeries, a happily symbiotic relationship. Unable to resist the allure of the menu section which I believe was labeled "Cold Meats and Offal," I followed with a charcuterie sampler featuring a chicken liver mousse, rabbit rillettes, and salt-cured foie gras. The rillettes were meaty and rich, but not as heavy as pork or duck versions. The chicken liver mousse, meanwhile, was an even lovelier combination of silky light texture and dense flavor, with a gin gelée cap providing a nice contrast. The foie, though, was best in show, though I wished for a more sizable portion than the meager disk given, barely larger than a silver dollar. Acompaniments of sliced pickles, a grainy mustard, and some tomato jam helped cut some of the richness. Orecchiette with seasonal vegetables was no trite "pasta primavera," instead being simply graced with delicious carrots, fennel and summer squash bound with sweet butter. A grilled quail, listed as an appetizer, was substantial enough to be a small main course. There were also several vegetable sides available, and possibly my favorite thing on the table (next to the foie gras) were the carrots, bursting with flavor and draped with a a hazelnut butter that nicely picked up their nutty goodness. Chard, cooked with some bacon, was less successful, the greens flavorful but still a bit tough. They had a very nice selection of cheeses, my only disappointment being that I cannot remember the names or producers of any of them other than a Vermont Creamery "Cremont" (the other two I tried were from Maine producers). Even better was a dessert which paired a blueberry-blackberry shortbread, nicely crumbly and not too sweet, with a pitch-perfect sweet corn ice cream. Meanwhile, Frod Jr., who can not resist the allure of a flourless chocolate cake, discovered an interesting twist on the theme here, a warm chocolate torte drizzled with a spicy caramel and served with an Aleppo pepper ice cream with just a subtle hint of heat. A glass of Broadbent Madeira finished things off nicely. The L'Ecole 41 Syrah we drank with dinner was priced at right around 2x retail, and generally speaking, throughout Maine we found wine lists to be stocked with some interesting, appealing and reasonably priced choices. Fore Street is the kind of restaurant I'd love to have in my neighborhood. 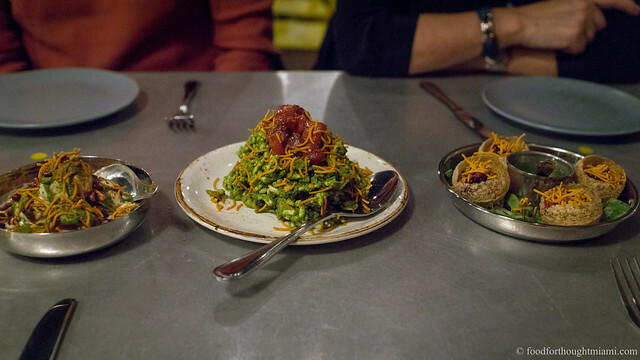 The place is comfortable and unpretentious, a style which is matched by the food itself. Tied closely to the offerings of the oceans and the farms, it's easy to sense that it's the kind of place where the menu changes with the seasons. This was an auspicious start for our Maine vacation. The restaurant's website indicates that they hold 1/3 of the tables for walk-ins. I have heard that if you show up when they open at 5:00 you will often have a decent chance of getting a table that evening. If you do not like to leave things to the vagaries of chance, I would recommend calling for a reservation rather than using OpenTable, as I found that they had limited times available on OpenTable but had more options open with a phone call. One of the things I find more challenging in writing about dining experiences while traveling is that I don't have the opportunity to retrace my steps. With local restaurants, I usually will pay multiple visits before writing about them, which gives a much better opportunity to get a feel for them (and also just do basic fact-checking). These travelogues are necessarily a lot less meticulous, which I often find frustrating. I know that doesn't exactly sound like a come-on to everyone. But it's that kind of gruff honesty I found so endearing. Of course, here in Miami we do: the style is similar to Michael's Genuine or maybe Red Light, though with a distinct New England culinary aesthetic.